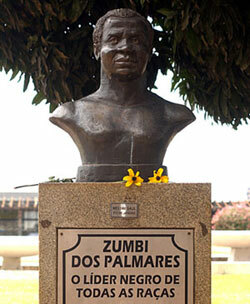 On this day in 1695, Zumbi dos Palmares, leader of a Brazilian state of freed slaves was beheaded by the Portuguese. Zumbi helped lead Quilombo de Palmares, a community that organized at its height some 30,000 inhabitants in a territory the size of Portugal. The maroon community led armed rebellions, encouraged slaves to escape, and withstood an almost century long military assault. They were finally overcome by superior artillery.